It’s elementary. All things must end sometime and now, the end is in sight for the Elementary TV show. It’s been announced that there won’t be an eighth season but, on the positive side, a seventh season of 13 episodes will wrap up the crime drama. The final year will bring the show’s tally to 154 episodes. Airing on the CBS television network, Elementary follows detective Sherlock Holmes (Jonny Lee Miller) and Doctor Joan Watson (Lucy Liu). This modern-day adaptation of the Sir Arthur Conan Doyle detective stories features some new spins on the classic crime-solving duo. Instead of assisting Scotland Yard, they crack New York City’s toughest cases. A former surgeon who lost a patient, as well as her license to practice, Watson began as Sherlock’s sober companion. Eventually, their relationship evolved into an investigative partnership. The crime drama also stars Aidan Quinn as Captain Thomas Gregson and Jon Michael Hill as Detective Marcus Bell. According to Deadline, when Elementary was renewed for a seventh season, it was decided that those episodes would also end the show. Why? It’s surely no coincidence that Liu and Walker’s contracts would have had to be renegotiated. The show’s network ratings have also continued to dwindle but the series is a lucrative money-maker in syndication and in international markets. SPOILER ALERT The cast and crew had been unsure if they would get a seventh-year renewal so they’d already shot the sixth season finale as an appropriate end for the series. While the sixth season finale left our heroes in London, they will be returning to New York early in season seven. Holmes nemesis Odin Reichenbach, to be played by James Frein, will show up in episode five. CBS has not announced a premiere date for season seven but it will surely air sometime in 2019. Season six aired over the summer of 2018, ending in early September. What do you think? Are you a fan of the Elementary TV show? Are you sorry that there won’t be an eighth season or, is season seven the right time to end the show? 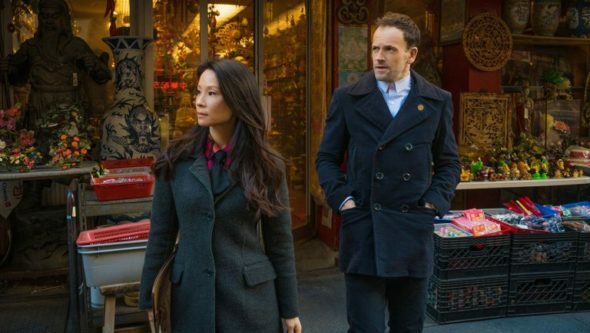 Elementary on CBS: Cancelled or Renewed for Season Seven? One of my favorite programs on CBS. Had hoped there would be another season. Information on the internet appears to be conflicting as to whether there is to be a season 7. Hope we do have another season. Is there any interest in the cable stations to pick-up Elementary solving cases in the UK? I hate that this show has ended and I miss it so much — there hasn’t been another show like it that has got me excited about being home to watch or making sure it’s taped so that I wouldn’t miss the show — the cancellation of this show has caused a HUGE gap in my television enjoyment. PLEASE bring this show back to life PLEASE!!! I really enjoyed this series. I liked the actors and the roles they played. Many clever story lines. The finale of 2018 left us wondering if that was the end so it is bittersweet that the show will return for one more season. Great show. I’m disappointed that this show won’t continue. The shows that are written with intelligent plots and complex characters seem to be on their way out and dumbed-down shows take their place. Too bad. It has surely run its course .Its a good show but it was becoming too unreal .Sherlock pomposity rudeness and seemingly incredible powers to solve cases was just no longer attractive .The way He sometimes would treat Watson as a surbodinate with no sense or will of her own was starting to become a put off.I will not even start on the detective …..Nevertheless it was a good run. oh no, say it isn’t so ! love this show. This is a good show. The best that I see about S.H in years. Is sad that it will finish. I think that CBS could have a season with stories from people that follow it. This one of my favorite shows. I haven’t missed a single episode.